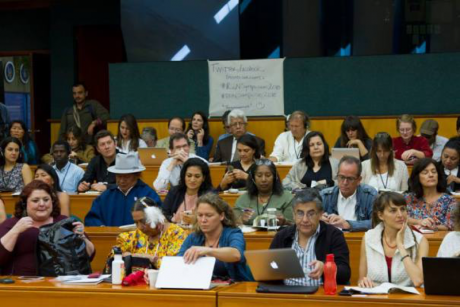 The final image is an image of the present: while representatives of indigenous peoples from different parts of the world celebrated the closing of the international symposium on the Rights of Nature (Quito, September 27-28, 2018) singing their traditional songs, the rest of the public, mostly mestizos and whites, were taking pictures and filming. The message was clear: after two days of long, drawn-out talks, discussions and statements at the Universidad Andina in Quito, we, the industrialized ones, need a keepsake of those who are still in contact with nature. A token that takes us back to our own past, when we - like all humans – enjoyed an intimate relationship with the Earth and the spirits, and were aware that our survival depended on their protection. Today, after having created an abysmal system of exploitation of nature, we want to reconnect. Even through an image or a video recording. As one young architecture student said during one of the panels at the symposium, referring to indigenous peoples: "I want to learn from you, I need to know the essence of what I am doing". 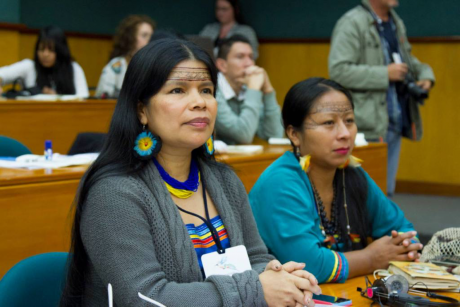 Ten years after Ecuador became the first State in the world to include the Rights of Nature in its constitution, the rights of industry and trade prevail. The spiritual emptiness of urban youth prevail, the multiple frustrations of adults prevail, and resistance on the part of indigenous peoples too. Wild and excessive exploitation of nature prevails - not its rights. Countering mining megaprojects, banana and shrimp monocultures and prevailing oil pollution, the preamble of the Ecuadorian Constitution sounds rather cynical: "We, the sovereign people of Ecuador, celebrate Nature, the Pacha Mama, to which we belong and which is vital to our being." Nevertheless, the concept of Sumak Kawsay, Good Living, has moved the planet. An oppressed worldview has been made visible, the worldview of the original peoples, and a movement has been created. Good Living has inspired thousands of students, intellectuals, politicians and activists around the world to change their way of thinking and their perceptions. 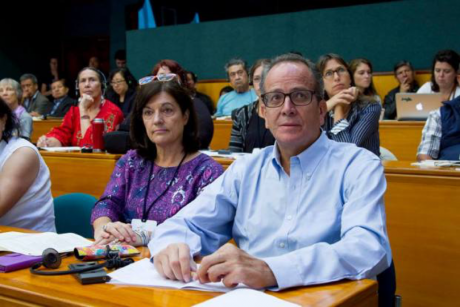 Alberto Acosta, who was the President of the Constituent Assembly at that time, keeps on giving lectures and talks on Good Living today. He himself confesses that he was surprised by the repercussion the new Ecuadorian Constitution generated. The vision that we are all indigenous allows us to come closer as human beings and makes us drop the role of the spectator. It allows us to leave our camera or cell phone behind and walk in the shoes of the other. When we started the process on the Rights of Nature, we asked ourselves if it makes sense to do it on a legal basis. And we said yes. Yes, it does make sense: for you. For us, nature has always had rights. Thus, the industrialized ones begin to take responsibility for their actions, stop resorting to pictures and videos, and give up projecting their hope for salvation upon native peoples’ actions. Diversity in a row: Shannon Biggs (United States), Casey Camp-Horinek (Ponca Nation, United States), Pella Thiel (Sweden), Pablo Solón (Bolivia) y Henny Freitas (Brazil). "When we started the process on the Rights of Nature, we asked ourselves if it makes sense to do it on a legal basis. And we said yes. Yes, it does make sense: for you. For us, nature has always had rights. So, if Western society needs to understand this on the basis of jurisprudence, law, a constitution, it is important. It is important that Western society understands." "We need a different kind of democracy, where nature is not simply an external object, but a subject. It must be an actor. This compels us to rethink how we are inventing democracy." "The Universal Declaration of Human Rights has been in effect for 70 years now. I ask you: Are human rights fully developed? Are we happy? I think that the answer is quite obvious. So, let's not expect that in ten years a new constitution will change the world, or Ecuador, overnight. Ten years is a very short time from a legal logic perspective. I think that in these ten years there has been a lot of progress, although surely not everyone agrees with this. However, instead of seeing the glass half empty, why do not we see it half full?" "We were very happy to hear a new senator in August mention, in his very first speech in the Senate, the Rights of Nature. In a country like ours, where the legal system is extremely stable, it is difficult to establish new ideas. This was very important." "Nature has its own operation law, its way of living, its way of materializing. It is not necessary for us to draw up a law including rights. Human beings are good at putting laws and constitutions before national institutions, but nobody abides by them. It is good to talk and give lectures in places like here, but if our culture lacks direct experience with the jungle, we will not be able to explain how the jungle is changing and how we humans are changing. Our struggle is not to defend the right of nature. Our struggle is the change that nature is projecting upon us." "If you have not yet been involved in this exciting movement, I encourage you to get involved in what I believe is a historic transition. We are talking here about a fundamental change in how we humans see our role on the planet: a change from seeing ourselves as rulers and exploiters to contributing to the health, beauty and well-being of the most wonderful community we have come across. " "The transcendence of the Rights of Nature is important. All the conservation efforts are in place - but they are not enough. All the efforts we make from within organizations, from civil society, NGOs are fine - but they are not enough. All the efforts that the academic world does are very important - but they are not enough. Participating in social media is also important - but it is not enough. We have to go from being spectators to being full actors in defending of the Rights of Nature." Today, whom does science serve? Science for whom? There is too much information and too much knowledge. But wisdom only rests in the hearts and minds of the original peoples. "Rights today are not only anthropocentric, but also androcentric. When I speak with my students about social inclusion I say: we include women, indigenous people, Afro-descendants, girls and boys, older adults, LGBTI people and farmers. Article 1 of my country’s Constitution states: The supreme purpose of the State is the human being. But who is that human being? What is the paradigm? The white, Creole, adult, heterosexual, non-disabled, urban man. That is the reason why, I think, many women have joined a resistance movement." "We, in Sweden, are like sustainability global stars. That is why it is somewhat difficult to question society and the system, because we continue to believe in government and think that, generally speaking, we are on the right track. But the reality is also that we have a very large ecological footprint, we keep on cutting down our forests and substitute them with plantations, we continue to allow mining, almost tax free. We are like a banana republic, possibly worse." "It is always too soon to surrender as a movement and it is not always a matter of winning campaigns or individual issues. Sometimes winning amounts to simply acknowledging you have lost, as in the case of Chevron. What have we learned in that process? What knowledge have we shared? What movement have we created? Did we have a good time together? Did we share our love for each other, our trust in others? This movement is going beyond. We are planting trees, although maybe we will not be able to sit in their shade. Our time has come. Let's go out into the world and fill it with hope, joy and love!"